Tara Rodgers (Analog Tara) performing at Sonic Circuits DC, September 2016. Dr. Tara Rodgers is a multi-instrumentalist composer and historian of electronic music and sound. She has an MFA in Electronic Music & Recording Media (Mills College) and a PhD in Communication Studies (McGill University). She is the author of Pink Noises: Women on Electronic Music and Sound (2010) and numerous essays on music, technology, and culture. 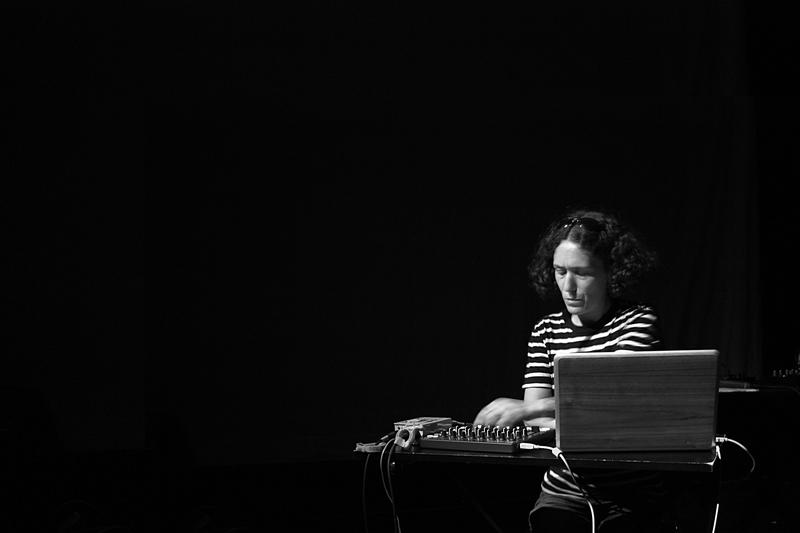 Her music, from techno and house (as Analog Tara) to sound art made with the programming language SuperCollider, has been presented around the U.S. and internationally. More information is available at analogtara.net; or find /pinknoises on Facebook and @analogtara on Twitter. I make music because it feels like my most natural way of being and the most truthful, complex, and full mode of communication available to me. I make whatever music comes out in the moment. It might be more or less recognizable with genre names like jazz, house, techno, electronic, ambient, or generative. I make music in many different ways. Sometimes I make music with an instrument, such as a piano or electric guitar, or with an ensemble of interconnected instruments, like a drum machine and various effects. Sometimes I make music by writing software in SuperCollider that generates sounds and sound patterns, or by working with editing and arranging techniques in a digital audio workstation like ProTools or Ableton Live. Sometimes these different ways of making music happen in sequence or in combination over the course of a project. Often, but not always, sound recording and music production techniques are inseparable from how I make music, because the end result significantly blends my performances with the processes of recording equipment or software. I use the term 'sound art' to describe some pieces I’ve made with the programming environment SuperCollider because these emerged through a stronger relationship to visual, spatial, and/or interactive design methods than to more conventional musical elements. I don't mind if these pieces are also called music compositions, but it seems more accurate to refer to them otherwise since their process or aesthetics don’t reference music in a primary or overt way. For example, in my composition “Butterfly Effects,” I was concerned with how to design dynamically-generated sounds with randomized parameters so that they could interact like insects or self-organizing robots—and not thinking much about a conventional musical element like rhythm, even if the result had a rhythmic pattern to it. I don’t worry about it too much, but I describe myself variously as a musician, composer, producer, and sound artist. These labels convey the things I do—playing instruments, arranging sounds and musical structures, crafting sounds and mixes in the studio, and attending to how sounds are designed and presented in context. Lately I’ve been saying ‘multi-instrumentalist composer’ since that seems to convey most everything in a concise way, especially if one considers recording technologies to be instruments. In terms of the cultural and historical context of my work: I’m a white woman who grew up in a small town in the U.S. playing piano from a very young age and listening extensively to certain African American music traditions, particularly jazz and blues piano from the 1920s-‘60s. This music was accessible to me in the 1970s and ‘80s mainly through my father’s passionate interests in jazz and hi-fi audio. I had the privilege of growing up in a household where I had some time, materials, and encouragement to explore music-making in an informal way outside of school. I’m primarily a self-taught musician who plays music by ear. So, I’m especially indebted to the solo jazz piano tradition which taught me a particular way of hearing the totality of a musical arrangement—how multiple sonic elements combine into an evolving whole. This has certainly informed the electronic music I make now. My musical life also aligns with specific chapters in the history of audio technologies. As I learned to play instruments by ear, I was always interacting with audio technologies: taping songs off radio, listening to cassettes and vinyl records, rewinding, listening again and again as I practiced. Having those technologies close at hand at that time, and then having home recording tools (like four-track recorders, then laptops) become more widely accessible as I began to pursue music professionally in the 1990s and ‘00s, made it possible for me to incorporate music production into my compositional process. On a separate note, I’ve long been inspired by other art forms—like modern dance and abstract visual art—as inspiration for music or ways of thinking about sound. I actually made a lot of visual art for a time in the early ‘90s, particularly photography and sculpture, before turning more fully toward music. And when I lived in New York City in the late-‘90s, I attended as many modern dance performances as I could—often thinking about patterns of movement in modern dance as a metaphor for spatialization and temporal organization of sounds. A high level of dedication, even devotion, to music is essential for me. It is like a never ending puzzle or maze. It takes so much time and I would give it all my time if I could. One of my biggest regrets is that so much time in life has to be spent on other things, like to make a living. Renewable curiosity is also so important; never settling into habits too much, always staying open to what may be sonically possible. For me, learning production skills has also been essential for expressing my musical ideas. How do you engage critically with digital music? I engage critically with digital music as a scholar and educator. I study the history and philosophy of sound and of electronic music instruments and culture. How does cultural history influence digital music today? My research has explored how longstanding cultural ideas about sound inform knowledge about digital music and sound in the present. For example, I examine how the metaphor of sounds as waves took on particular momentum in English-language acoustics texts in the late-nineteenth and early-twentieth century, resonating with concurrent cultural fascinations with the sea and colonialist narratives of maritime voyage and discovery. I’m interested in the ways that ideas like this can persist over decades and inhabit electronic music cultures in the present. For example, we see modern synthesizers given names like the “Odyssey,” and continue to find old themes of exploration and “taming the unruly waves” used in audio-technical and media accounts in ways that position white men as the primary subjects of electronic music history and culture. I encourage digital music students now to approach their audio-technical textbooks and product manuals like a form of literature in the broadest sense. In other words, we may read these texts to glean useful technical insights, but we can also interpret them as stories about sound that have a very particular cultural history.